Once you've started researching your keywords you’ll probably find thousands that you could use on your site. As you'll most likely not have the time to target all of them, you should have a method for choosing the best ones. Owen Powis outlines his method. Organize your pages into categories. Each page should be targeting one keyword. Don’t target the same keyword on different pages. That organization is your site structure. Always get your site structure right before you start creating content. The keyword you target on each page will determine whether that page has the potential to attract traffic. That’s why keyword research is important: pages with well chosen keywords have more potential to attract traffic to your site. Start by mapping one target keyword to one page. (Later, we’ll break that rule by targeting secondary keywords). Before you choose which keyword to target, identify the main theme of the page in question. The theme is the subject of your page, so write your content to reflect it. Google likes relevant content and directs users to relevant content, so there's no point using keywords which aren't relevant to your theme. Let's look at an example of how to find your keyword targets using the main Keyword research tool within Wordtracker's Keywords tool. I'll pretend I own a website which sells laptops and laptop accessories, such as laptop chargers. There are lots of different types of laptop chargers, so I've created a category within my site for laptop chargers. I want to find the best keywords for that category page. Level 1 represents the site’s home page: we’re targeting laptops. Level 2 represents the site’s category pages: you can see laptop chargers is the first category in the list. Level 3 represents the product page or sales page for each brand of charger. Which are the best keywords to target for my page? If you’re starting a new site, it’s unlikely that you’ll get much traffic from such a competitive keyword, but you should still include the keyword in your site structure. Once your site becomes more established, you could start attracting traffic from these more popular terms. Looking at the results in the list, there are lots of keywords that relate to specific brands of laptops. I’ll be targeting these terms on my product pages, so they’re not suitable for a category page. On the category pages I want to target keywords that are not brand specific, ie generic keywords. My guess is that laptop batteries and chargers and universal laptop chargers are the best choices from the remaining keywords. This gives me a total of three terms that I will target on this page. 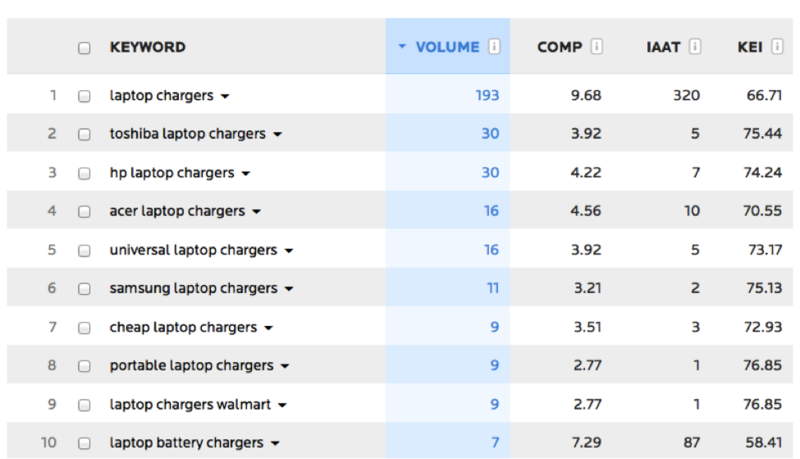 Laptop chargers has the highest volume (it’s searched for more frequently) and is the head keyword. This will be my primary keyword. Laptop batteries and chargers and Universal laptop chargers have lower volumes (they’re searched for less often). So, these will be my secondary keywords. So, I've found my targets in the Keyword tool, and I’ll select them as shown on the right hand side of the image below. Let’s look at another example. I am using the Keyword tool to find the best keywords for a page about buying mountain bikes. Here are the most popular keywords (those with the highest volume) within the group. 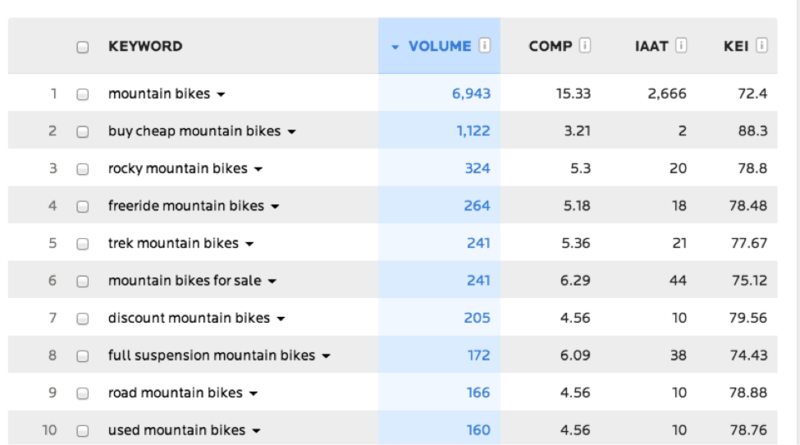 The screenshot shows the mountain bikes keyword niche. This is also the most popular (highest volume) keyword. So, I will take mountain bikes as my primary keyword. In most circumstances the most popular keyword should be your primary keyword as it has the most potential to attract traffic. You definitely want to choose one primary keyword, but you might also choose two secondary keywords. As in our previous example the keywords should be a close match to the content of the page and I'll not be including brand terms, as I will use these on my product pages. Looking at the remaining keywords, buy cheap mountain bikes is relevant and popular, as is discount mountain bikes. These will be my secondary keywords.